Bundles enable you to curate and share small groups of Gallery content externally with prospects as well as with key internal stakeholders. With Gallery Collections, you can share a single piece of content with someone—with Bundles, you can share multiple pieces of content via a microsite that is designed to help you lead your audience on a content journey, versus sending an email with many different attachments. We've heard from the B2B marketers we partner with (and experienced first-hand) that it's challenging getting the right content to your internal stakeholders—and even tougher to do the same for prospects to accelerate the buying cycle. In fact, we reported that 55% of marketers don’t know which assets sales uses most and 68% of marketers believe sales isn’t using marketing content to its full potential. With Bundles, you can direct prospects to the specific content assets they need in the sales cycle. Beyond curating your content inventory in Gallery to help customer-facing teams find and share individual pieces of content, Bundles allows those teams to create tailored experiences for prospects, customers, and any other groups who should receive it. To add a personal touch, salespeople working with larger opportunities use Bundling Content to create a place to direct their prospects, providing them with personalized, organized assets to help drive their decision making. Add in associated names and contact info in the Bundle description so there's no confusion on who this Bundle is coming from and going to. Order matters when you share a Bundle. Put the content assets in a Bundle in the order you want the recipient to read the content to tell a coherent, thought-out story that makes an impact. Lean sales teams use Bundles as standardized playbooks that they can share with many prospects. When you create a Bundle, make sure its title is clear and actionable. Personalize its note with a description that targets who will receive it, and don't forget to include your contact info as a helpful reminder. Give related Bundles the same color, like for Bundles that are all intended for a generic sales play versus Bundles targeted to a single key account. Make sure your Bundles are seen by the right people by managing access to them. Since they're so personalized, Bundles are useful only to certain individuals or groups. Keep in mind that Bundles hold up to 60 content assets, differing from your Collections which serve to contain large volumes of content. When you're in Gallery or looking at Gallery from the Salesforce Gallery App, you'll see a tab for Bundles. You can see the date it was last updated and shortcuts in the bottom right of each to edit the Bundle, delete it, or get quick access to a share link. At the top of the page is a search bar to search for content in your Bundles, as well as a blue Add New Bundle button to create a new Bundle. Click on the blue Add New Bundle button to create a new Bundle. In the pop-up modal that appears, give your Bundle a title, add any relevant notes for who will be receiving the Bundle, and choose a color for it. Click on a Bundle to view and, if you own it, edit its content. For new Bundles that don't contain content yet, click on the green Get Started button to start adding content. To add one of the multiple pieces of content to a Bundle, click on the grey plus icon to the right of the name of each content. 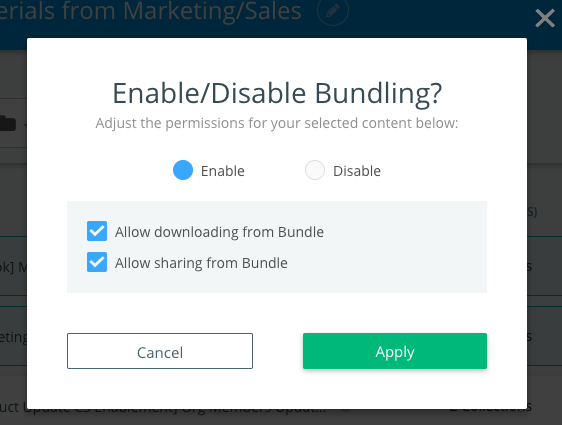 You can add any content that you have permission to see and is marked as add-able to Bundles in its settings (scroll down to read about Bundles permissions). Note that Bundles do not have auto-add rules or filters like Collections do. Bundles are intended for less than 60 pieces of content. You can use Global Search on this page to look for the content you'd like to include. Next to the search bar are the heart icon, which you can use to filter for content that you have favorited, and the pin icon, which you can use to filter for pinned content from your available Collections. As you add content, you'll see a live list of the content selected to be included in the Bundle. You can choose the order the content appears in a Bundle by moving the content in the live list from the Add Content space or Board Settings. Click on a piece of content to drag and drop it in the order you'd like for it to appear in the Bundle. Expand the Settings area by clicking on the Settings icon on the top right-hand side of the page. Here, you can edit a Bundle's title, color, contact information, as well as add or remove content and add a personalized note for the recipient. Any changes you make as you create a Bundle will automatically save in real time. You can also add content to Bundles directly from a Collection. You'll see a grey plus icon on content in a Collection which you allows you to add it to a Bundle. Click on the plus icon to open a pop-up modal. In addition to adding the piece of content to a Bundle, the modal also gives you the option to create a new Bundle. Some pieces of content will not have the plus icon or may not appear in the Add Content space when editing a Bundle. This means that the content has been marked in your instance's settings as not allowed to be added to Bundles (e.g., internal content that should never be shared outside of your organization). You can delete a Bundle from the Bundles home view, the Bundles header, or from within a Bundle by choosing Delete from the More drop-down menu. Check the box in the pop-up modal to confirm you would like to permanently delete a Bundle. Deleting a Bundle will not delete its content from the Gallery. You can decide what content in your Gallery should be allowed to be added to Bundles. To access this setting, click on the Manage icon on the top right side of your page. Just like you manage sharing and downloading options, you can select content to manage what content can be put in Bundles. Use the cog icon drop-down menu to determine Bundle settings. In the Bundle setting pop-up modal, you can enable or disable the content to be added to Bundles. You can elect to allow the content to be downloaded or shared from a Bundle. For example, you may want to share a piece of content with a prospect to just view it and not be able to download or share the content with anyone else. You can also see and edit whether an asset can be added to Bundles in Studio. When you're looking at a piece of content in Studio, the Gallery section will show you whether or not the content has been enabled to be added to Bundles. Check or uncheck the box next to Bundle to edit this setting. The Advanced Settings options for Bundles will enable you to select if the content should be allowed to be shared or downloaded from a Bundle. The ability to create a Bundle is by default an Admin-only ability. When Bundles is turned on, only Admins will be able to create Bundles, unless in that instance’s Gallery Settings permissions, editors are allowed to manage content and settings in Gallery; in this case, both Admins and Editors will be able to create Bundles by default. If you want more users to be able to create Bundles, you can enable that through Gallery Settings permissions. Important: You can see Share, Download, and Bundle permissions within the Gallery section on the content in Studio, on the Content Preview Settings within Gallery or through a bulk action with Manage Content in Gallery. If content is not marked as shareable (if share is disabled or is unchecked) for the Gallery, then by default it will not be marked as Bundle-able. By default, if content is marked as shareable, then the option to Bundle will also be checked. Regardless if the options for download and/or share are disabled, users will still be able manually override the default by checking or unchecking the option to Bundle the content. By default, when a user creates new content, the Bundle option won’t be checked if share is disabled or unchecked. Similar to existing content, if the options for download and/or share are disabled or unchecked on new content, users will still be able manually override the default by to checking or unchecking the option to Bundle the content. On new content, when the option to share gets automatically checked when it’s published and/or has a publish URL, then the option to Bundle will also be automatically checked. It’s important to note that if a user manually changes the share or Bundle permission, that will override any logic. For example, if a user creates new content and manually adds a URL, and then manually unchecks the Bundle option, then that option will not be re-check when another URL is added. You can manage access to control who is able to view or edit a Bundle you own or are the creator of. For detailed information on using Manage Access, read this article. You'll find the Manage Access feature from within a Bundle by clicking on the More drop-down menu. You'll also find the Manage Access icon for Bundles when you're viewing a Bundle in the upper right-hand corner of the page. Use the pop-up modal to enter in the information to share the Bundle internally or externally. Once you make a Bundle public, you can copy the public link from anywhere. Creating a public link means that anyone with the link can access the Bundle. If you copy a Bundle's public link and send it to someone via email, they'll be able to click that link to access the Bundle. This method of sharing Bundles provides anonymous metrics for Bundles shared with and viewed by an external party, meaning you'll be able to know that Anonymous Person looked at Demo Bundle three times and looked at Content Asset 1 and Content Asset 3. If in the External Access tab in the modal you enter a specific email address, the Bundle will only be accessible to the email addresses specified. In order for a non-logged in user to access a Bundle that has specified email addresses, they must enter in a specified email to gain access to the Bundle. When you share a Bundle externally with logged in users or non-Kapost users, they will be able to see the Bundle, click into its content to view it, and see a menu on the right-hand side of the content to quickly navigate through the remaining content in the Bundle. The content details for content being accessed through a Bundle appear differently than what users see when they access it through a Collection. 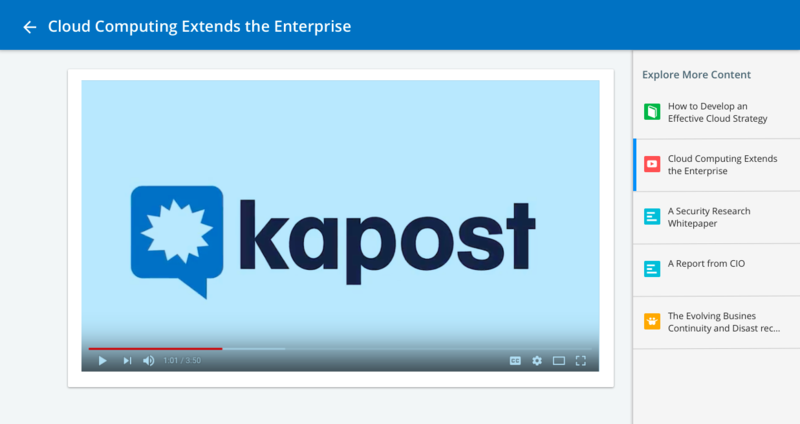 If you're not logged in to Kapost, you can see more information on a piece of content by going through a Collection versus the information a logged in user can see when accessing the content through a Bundle. This view is streamlined to make it optimally enjoyable for a prospect viewer. Bundles data will be exposed via the Kapost API; this data is not visible in Kapost. If a Kapost user is logged in and using Bundles, data will show that person’s activity. If someone uses their email address to view a Bundle, their activity is attributed to the email address. If a Bundle is public and accessible by anyone who has the link to view it, all non-logged in people who view it will be logged as “anonymous” in the metrics. Bundles will generate activity reports of shared content across opportunities, leads, and contacts for sales. 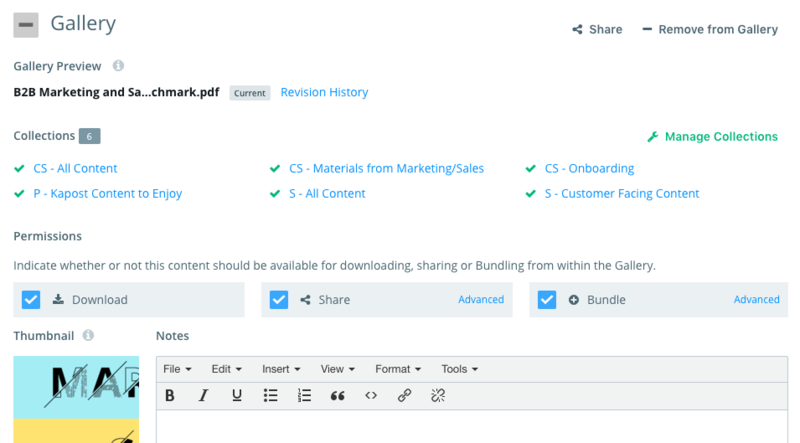 Bundles supports all content formats (PDFs, videos, Word documents, PowerPoints, etc.) and do not have a file size limit. Information on Kapost's API can be found here in the Help Center, and you can access the Developer Documentation here. For Kaposters using the Salesforce Gallery App, when you look at Bundles in Salesforce, note that Bundles functionality works exactly as it does from within Kapost. In addition, you can select SFDC contacts or leads for the manage access external tab, and you have the ability to record Bundle shares as a result of sharing them with these recipients. Using Bundling Content in the Salesforce Gallery App requires consumer licenses. The only difference to keep in mind when you're working from within Salesforce is that the emails you have stored as your contacts in Salesforce will populate when you share a Bundle externally. When you're working in the Leads, Contacts, or Opportunities tabs in Salesforce, the associated email addresses for those people will appear at the top of the email list when you share a Bundle to make them quick to add. When searching for users in Bundles within Salesforce, it’s not possible to include a space in the query because the search applies to email addresses (which don’t have spaces in them). When you're ready to share a Bundle from Salesforce, you can choose to record this as an activity. Please submit a support ticket if you're experiencing technical difficulties with Bundling Content.